Humana supports the School with funds generated by the management of used clothing in Spain. 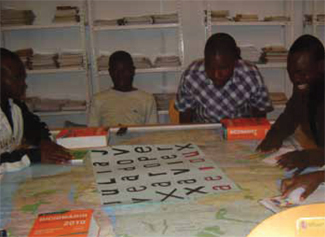 Since its creation in 2007, has graduated 220 teachers through the efforts of our local partner, ADPP-Angola, and the collaboration of the Ministry of Education of Angola, who have contributed to the deficit of existing teachers in the area and improve the quality of primary education in rural areas. Teachers also contribute to the mobilization of the whole community, to drive its progress. Last August 90 future teachers began their training, ie just twice comprised in the promotion. The training program includes an internship that allows to apply the lessons learned in the field, serving also extra motivation element for future teachers. 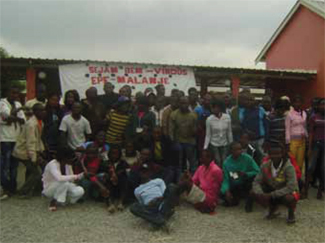 EPF students are organized into micro groups, each of which works closely with a public primary school in the vicinity. The 90 students of the Class of 2011, for instance, are distributed in seven schools and a total of 21 classes, with an average of 35 children per class. Practices are held in the mornings, while the afternoons are continuing with their theoretical, both educational and other disciplines, such as learning Portuguese. Thus, a strong connection is obtained between theory and practice. Prospective teachers also developed small community development projects, such as adult literacy classes, construction of facilities, such as latrines or classrooms, growing vegetables or raising awareness about HIV / AIDS.